A lovely and delicious chocolate layer cake you'll want to serve at almost any holiday or celebration. If desired, place pecan halves around cake edges for a decorative touch. Preheat oven to 350 degrees F (180 degrees C). Using a small brush, lightly coat three 8-inch round cake pans with softened butter or nonstick vegetable cooking spray. Dust with flour and tap out any excess. Set aside. until well incorporated. Reduce mixer speed to low and add the chocolate mixture and vanilla. Add the flour mixture by thirds, alternating with the buttermilk and ending with the dry ingredients. Thoroughly clean the mixer beaters. In a medium bowl, beat the egg whites to soft peaks. Use a rubber spatula to gently stir a half cup of the beaten whites into the batter. Fold the remaining whites into the batter. Divide the batter equally between the pans and spread evenly. Bake on the middle rack of the oven until a tester inserted in the center of each cake layer comes out clean, 30 to 35 minutes. Cool in the pans on a wire rack for 15 minutes. Use a knife to loosen the cake from the sides of the pan and invert onto the wire rack to cool completely. Place one layer on a cake plate and top with one third of the Coconut-Pecan Filling. Repeat with second and third layers and remaining filling, leaving sides of cake unfrosted, OR as an option, just fill cake layers with Coconut-Pecan Filling and frost the top of cake with the Coconut-Pecan Frosting (not the sides of cake); then spread the Chocolate Buttercream Frosting on sides of cake. 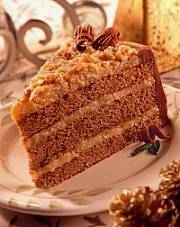 If desired, place pecan halves around top edges of cake for a decorative touch. Serve or store cake in an airtight container at room temperature. Make the filling: In a medium saucepan, combine the sugar, milk, butter, egg yolks, and vanilla. Cook over medium heat, stirring constantly, until thickened, about 10 minutes. Stir in coconut and pecans. Transfer to a bowl and, stirring occasionally, allow to cool to room temperature before filling and frosting the cake. Beat butter in small bowl. Add confectioners' sugar and cocoa alternately with milk; beat to spreading consistency, (additional milk may be needed). Stir in vanilla. I have been trying to tweak my German Chocolate Cake recipe. In the past, the layers would be tasty but gummy and crumbly when sliced. This one is different. It not only tastes absolutely delicious but slices well too. This is a keeper! I toasted the nuts prior to adding them to the filling for an enhanced pecan flavor. Also, three 9" cake pans would be better to use. The height of the 8" version is too high. My sister took the cake to work to share with her coworkers and it received rave reviews. I've finally found my German Chocolate cake. Thank you! I made your other German Chocolate Cake (located under 'Cakes') and wanted to compare the two realizing that the recipes were slightly different. My compliments. This cake was divine. Moist and sweet with a lovely texture. Thank you, I will be making this one again. An extremely moist and yummy cake making a towering impression. I adjusted the ingredients for 9 inch cake pans. The result was a cake almost too high. Next time I will use the unadjusted recipe with 9 inch pans. The cake was so moist it was tricky to extract the layers from the pans despite spraying and flouring. Also, the cake was so fragile it was difficult to apply the rather chunky frosting. It seems it would be better to make the layers a day ahead and let them age a day before applying the frosting. The outer chocolate buttercream frosting seemed way over the top so I omitted it. I used Trader Joe's milk chocolate instead of the Germans sweetened chocolate and it worked fine. I heartily suggest trying this cake. YUM! Question for you- does frosting use unsalted butter? I look forward to making this for upcoming dinner party. Absolutely an excellent quality of cake. Can be customized with different fillings and still taste lovely. Thank you! This cake is delicious. I used 1 1/2 cups of whole wheat pastry flour & 1/2 cup all purpose flour. Dagoba 100% cacao unsweetened chocolate instead of the German chocolate. I only used 1/2 cup sugar in the frosting. Since the coconut is sweet enough. I baked it in 3 9" pans instead of 3 8" pans since the batter was so fluffy. The cake was still high, but maybe not as high as it could have been using an 8" pan. After the cake cooled & was frosted, I covered it in saran wrap & put it in my Tupperware cake taker. It has stayed moist & delicious. Next I will try a devils food cake using this coconut frosting recipe, as I love dark chocolate. I would highly recommend making this cake. Try the whole wheat pastry flour. It makes the cake a little healthier.